There have been some recent staff changes here at the Port Phillip & Westernport CMA with new team members filling a number of roles, including the Regional Catchment Strategy Coordinator position. Ian Morgans retired in August 2018 and Stuart Hall was appointed in September 2018, arriving from Willoughby City Council with extensive experience in environmental policy, developing bushland plans of management and delivering educational programs. Stuart’s first task is to review the current Regional Catchment Strategy (RCS) and develop a new RCS for the Port Phillip & Western Port region for implementation in 2020. The RCS is the overarching environmental strategy for the region that defines environmental assets and sets targets for their future condition. The PPWCMA is currently waiting for new guidelines to be released in the first half of 2019 by the Victorian Catchment Management Council. The guidelines will assist in preparing the RCS 2020-2026. Over the last month, Stuart has met with current RCS partners (local governments, Parks Victoria, Melbourne Water) to discuss the past successes and future opportunities for the RCS. 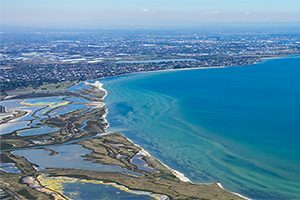 The current Port Phillip and Western Port Regional Catchment Strategy can be viewed at ppwrcs.vic.gov.au.